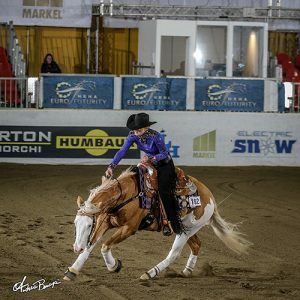 NRHA European Futurity » Gina Schumacher and Colonels Danger Zone steal the show! 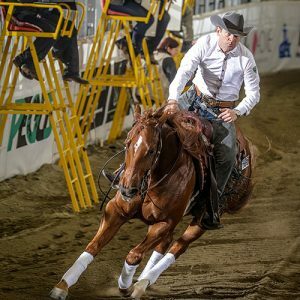 Cremona, April 5 – Provided by Simona Diale/IHP – The very last horse-rider-combination to enter the show arena in Cremona tonight wore the first 2019 National Reining Horse Association (NRHA) European Futurity Champion crown: Gina Schumacher and Colonels Danger Zone. 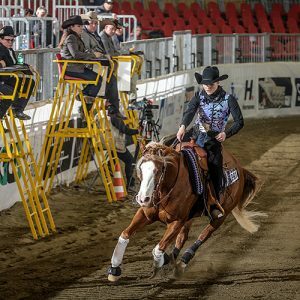 The young German rider, a multiple past NRHA Non Pro World Champion, had written her name in the books on the first day of competition after posting the highest score in the Level (L)4 Non Pro go-round aboard her second mount, Shiney Dun Face. On finals night, riding Colonels Danger Zone (Lil Gun x Step Un And Play), aka ‘Nils,’ Schumacher closed her run with a 217 to clinch the title.